According to the Federal High Way Administration, a minimum of 5 feet or 60 inches is required for sidewalks and residential walking paths. Shoveling or snow blowing a path this size can take a long time costing you time and money. 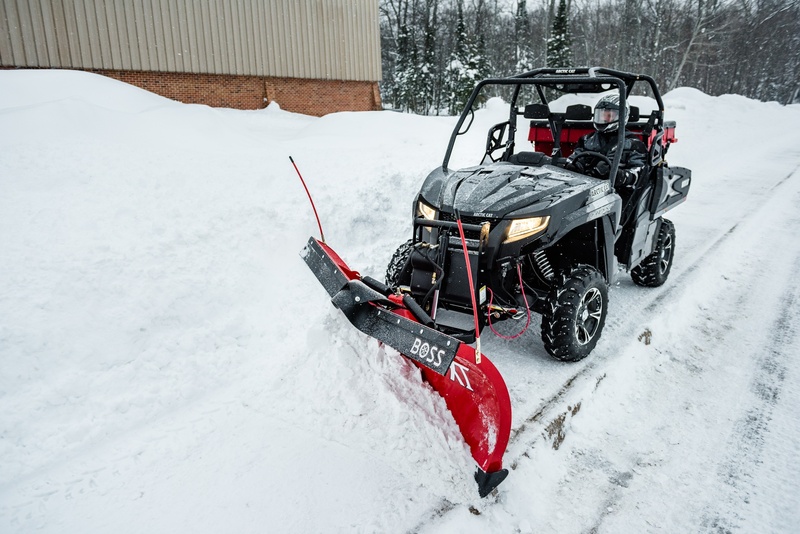 The BOSS ATV and UTV snowplows come in a variety of sizes to easily clear paths 60 inches or more in a few easy passes, increasing your productivity and freeing your time to take on other contracts. Make clean efficient passes with the ATV and UTV snowplow sizes available. One of the top features of a BOSS ATV/ UTV snowplow is the high-performance hydraulic package. No winches or chains involved. Maneuver your snowplow without ever leaving the cab or seat. The Quick Attach System and fully hydraulic package make this plow very user friendly. The fully hydraulic plow increases speed and efficiency when attaching, detaching and operating. The enclosed hydraulic system protects it from the elements to prevent corrosion and hydraulic freeze up. The UTV operates using the SmartTouch2 controller, the same controller used on BOSS truck plows while the ATV utilizes a handlebar controller for safety and ease of use. The benefits don’t end there. 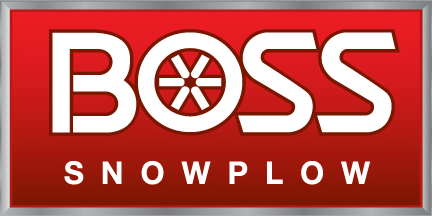 The professional grade BOSS ATV and UTV snowplows come with additional benefits for clearing sidewalks. With a 30 degree lift height, the plow has superior snow-stacking abilities for clearing large amounts of snow for when Mother Nature is relentless. BOSS also offers a spreader for UTVs to complete the arsenal and battle ice buildup on sidewalks. The BOSS VBX 3000 has 12 cubic feet of capacity operated by an in-cab switch and features an auto reverse to virtually eliminate jamming and a blast function to quickly spread material in a designated area. Now your UTV can take care of both the snow and the ice build up to keep your neighborhoods, business, or organization safe. It’s always important to consult the Product Selector tool to match a plow to your vehicle and needs. If you do not already own a UTV but are interested in buying one to use for snow removal, take a look at the undercarriages available-UTV/ ATV. If you want to see the ATV/ UTV snowplow package in action, click here or view the video below. For additional information visit bossplow.com or e-mail us at sales@bossplow.com.